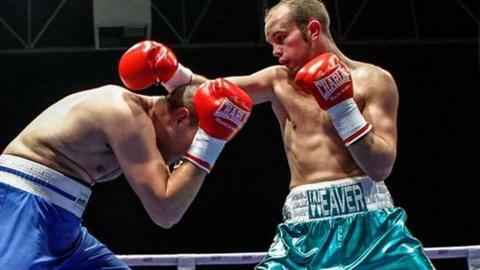 Former GB amateur star Iain Weaver has written to the British Boxing Board of Control seeking an explanation after another boxer was cleared to fight despite a similar condition. Weaver was refused a licence last year after a scan revealed he had a cyst, despite being cleared by two independent specialists. However, he hopes the case of Robbie Turley will prove to be a precedent. "I find this highly hypocritical of the BBBofC," Weaver wrote in his letter. Turley has been out of the ring for 20 months because a routine pre-fight brain scan revealed a pineal cyst, but is due to fight again next month. Weaver's application was turned down because a routine medical revealed a different type of cyst, but believes his case should be treated in the same way. The Dorset-based boxer sought independent advice from four neurology specialists who stated the type of cyst was not unusual and that in their opinion he was fit to fight. Weaver, who won silver at the 2010 European Amateur Championships, has won all four of his professional fights under non-British licences and is scheduled to make his next appearance in Barcelona in December. Speaking in January, the board's general secretary Robert Smith defended their stance. "We take advice from various medical specialists and if there is any danger at all, no boxer will be granted a licence," he told BBC Sport. "We have received his medical and we have received opinion from two specialists that have been considered by our medical panel. "But he has been unable to pass the board's medical." In his open letter, Weaver asks for an explanation from the board in light of their decision to clear Turley. "I learned that one of those you had refused to licence, Robbie Turley, has now been granted a licence by yourself, following his team initiating legal proceedings against the BBBofC," the letter said. "I find this highly hypocritical of the BBBofC, who refused to licence myself even though you had received written statements from neurology specialists, each stating that they see no reason why I should not be licensed to box professionally, especially in light of the amount of international boxing contests for Team GB I undertook as an amateur." He added: "I feel that the BBBofC members, the boxing world and the general public deserve some sort of explanation from yourself." Weaver's father Jay told BBC Sport they would now consider legal proceedings against the board. The BBBofC has yet to give a response to Weaver's letter.